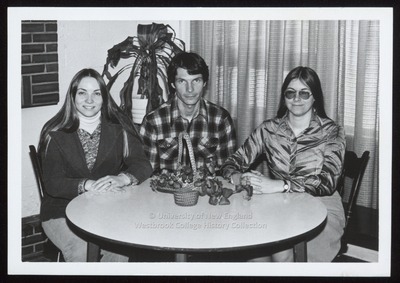 "Three Students at Round Table, Westbrook College, Class of 1978"
Three Westbrook College students from the Class of 1978 sit together at a round table in this candid black and white photograph. Two young women sit on either side of a young man. One wears a dark jacket over jeans, a sweater, and a white turtle neck jersey; the other wears a skirt with a shiny, silky long sleeve blouse and darkened aviator glasses. Both have long hair, parted in the middle. The young man wears a plaid flannel shirt and sits behind a basket filled with a fall floral arrangement of Japanese lanterns.